What are the differences between all the Sonos Play speakers and which Sonos speaker is best for you? Sonos Canada has a few different speaker choices from the smaller Sonos PLAY:1 to the bigger items like the Sonos Playbase. Yes, you can use Sonos with wireless access points but only in BOOST Setup. BOOST Setup is when you connect your Sonos directly to your internet with an Ethernet cable. This will make a Sonos Dedicated wireless network that all your Sonos speakers will connect to. In the diagram above (BOOST SETUP), the green line illustrates how Sonos operates on a dedicated wireless network that is separate from your home’s WiFi network. The PLAY:1 in the room on the left side of the house can still connect, even if it’s out of range of router’s WiFi network, because other Sonos products in the home are able to pass along and extend the dedicated wireless network signal. In the diagram above (STANDARD SETUP), the blue lines illustrate how each Sonos product communicates to the wireless router over the same WiFi network as other devices in the home. Sonos will only work in rooms in your home that are within range of your router’s WiFi signal. Can I use Sonos without internet or a router? Unfortunately No. Sonos was designed to use internet and Wifi to connect and work properly. Without a broadband internet connection and router your Sonos will not work. What is the range of the Sonos Systems? The range of your Sonos system depends on your router. If you are using a Standard setup you’ll only be able to connect Sonos speakers that are in range of your routers Wifi. If you decided to go with the BOOST setup then plugging in a Ethernet will make a dedicated Sonos wireless network where each Sonos product you use in your home will help expand the range of the Sonos dedicated network. How do I get the Sonos App? If I close the Sonos app will the music stop playing? To get the sonos app visit your google play store or Apple store and search SONOS. Download the app and follow the easy step by step setup. Sonos app will continue playing music if your music is being streamed from the internet, if your music is downloaded onto your computer, phone or tablet the device will need to remain on to continue playing music. Sonos has made a special product called the Sonos Connect. The Sonos Connect links to your system’s receiver/amplifier using standard RCA cables. This will let you use the Sonos app on your devices to stream music, control volume and other settings. 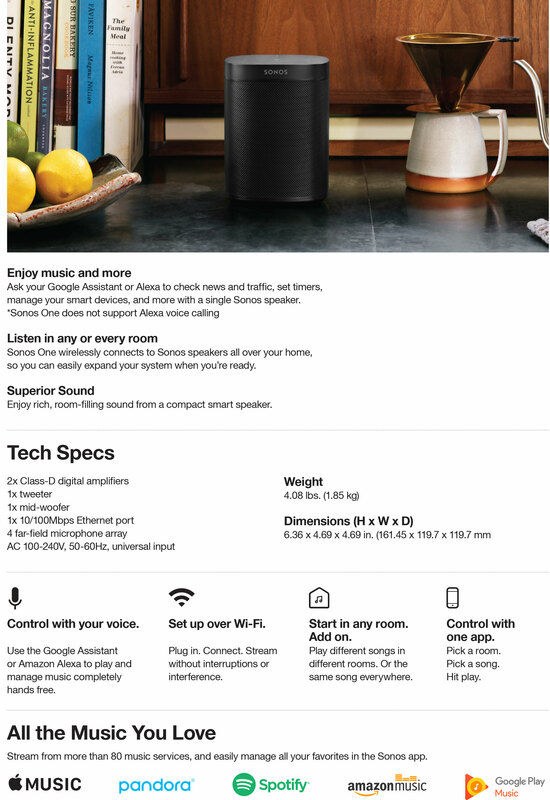 For systems that have passive wired speakers without an amplifier or receiver you can purchase the Sonos Connect: AMP by using high-quality speaker wire.